For those wondering if there are any cool mazes near you, go to Maze Play and search by your zip code. There are an crazy amount of intricate mazes out there right now. This is a picture of one of our nearby farms in Eastern NY and it’s incredible. 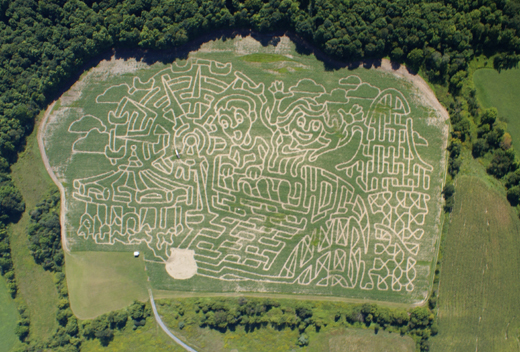 If you want to learn more about this particular maze, there is an article on it in this month’s Berkshire Living Magazine written by my beer blogging buddy, Alison McGee. I just love when people take it to the next level. Why bother doing something half hearted when you can go all out and make something A-mazing. I really have to remind myself to do less so that the things I do are of high quality and not mediocre. Trying to do it all is not always the best approach. Thank you so much for writing this post for me!! I feel honored! We live about 5 minutes from the Bloomfield Hills corn maze, but your place seemed so much more ‘special’. My son is actually going to the corn maze this weekend. I hear there are animals there, so that is fun, although not unique. I am going to check out the maze play website too as I am heading to Grand Rapids for soccer this weekend. I really appreciate the research you did!!! You are the best! Kris- Well, I do live in Farm Country. I’m sure our car shows couldn’t hold a candle to the ones in Mo-Town, so I guess we all need to embrace what we can in the geography we’re in. Don’t you guys have crazy cherry festivals every year. I bet those are fun too. This is incredible! You are absolutely right. What may seem a waste of time to some is a job of love and passion for others. And what a perk when you get to see or experience someone else’s passion at this level. That is cool. Reminds me of the time I went into a corn field with my cousins many years ago when we were young and played hide and seek… wow, in some ways it feels like yesterday. Thank you so much for the mention, Sandy! Being pretty budget-minded about my own activities, I agree there’s definitely an stronger appeal to putting money towards locally based events. We’re blessed that the Berkshires offers all this so easily and, while summer is an obvious time for that (with all the cultural events and farmers’ markets), I feel like fall is the Berkshires’ time to shine. Not just for the great foliage, pumpkin and apple picking, corn mazes and all types of festivals, hiking, etc. I do recommend the corn maze at Tammy’s Candy Kettle, after writing the article I went and did it with my little brother (through big brothers big sisters), he’s 8 and he had a blast–they had a lot of other fall-themed activities, and their restaurant is a great stop for lunch or dessert after. Not being a finance person myself, I really appreciate how practical and applicable your posts are! To your point, I agree that it’s important not to do too much, and to focus in order to do things very well. The clutter can be distracting to what’s most important. Corn Mazes have slowly become an accidental tradition in our family. While not directly planning for it, we have now went the last 4 or 5 years to farms with corn mazes. This year just my wife and daughter went though. My son decided he wanted to go to the toy store instead. Sandy – believe it or not, I have never been to the auto show. I guess I just don’t have the interest. Plus, they are in the winter and downtown, blech. The cherry festivals are about 4 hours north of where I live. I have been to the city that hosts them, but it is crazy busy there during the actual cherry-festival, and expensive. Thanks again for thinking of me! I can’t remember how it came about, but hubby and I went to a corn maze 4-6 years ago. It was fun and I love the little petting zoo they had. Thanks for that link. Too bad there’s not one within 100 miles of me. However I did find one slightly outside of that radius in Bakersfield. I’ll have to give it a try during my Thanksgiving break! Very nice. It reminds me of playing in mazes when I was a kid. Honestly, I don’t think I have ever been to a corn maze though.